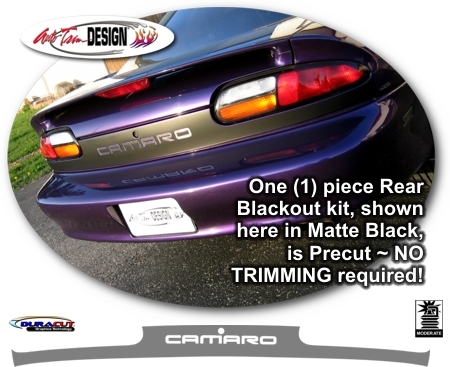 Toughen up your '93-'02 Chevrolet Camaro and give it that distinct "muscle car" look with our one (1) piece Rear Blackout Kit. Graphic piece is precut (including cut-outs for CAMARO indentations) and ready to install in a wide variety of colors - NO TRIMMING required! Graphic kit consists of a prefitted and contoured piece as shown in the image and specifically fits any '93-'02 Chevrolet Camaro. It will not fit any other vehicle. CAMARO lettering decals shown in image are not included. Installation of this kit may require removal and reinstallation of existing factory applied emblems.